In this article, we came with the best free business WordPress themes that probably fit all the business requirements and needs. If you are planning to launch an online business venture, then you came to the right place. I think it is not necessary to emphasize the importance of an online business venture. As you already know that, most of the business owner has set up their business in the web world. They have created a professional and engaging business website and attracting many visitors. So, the main question here is how making your business website stand out of the crowd in this competitive era. But the face is, building such a website is really very stressing and challenging. But don’t worry! Let the WordPress handle all the website building tasks. WordPress is one of the most popular Content Management System that offers tons of free and premium WordPress themes. It is very simple and comes with user-friendly customization options. Any newbie can easily set the theme options and create a beautiful website. Not only this, there are various free and premium WordPress plugins that contain a crucial extension to make your site more powerful. Don’t know from where to get free and premium themes? There are ample free themes and premium themes on WordPress.org and Themeforest.net. Moreover, There are other WordPress based websites like Code themes, Yudlee Themes, Rara Themes and so on, which has plenty of WordPress theme for different categories. Domain name shows the purpose of your business to the visitor. Your websites and domain name must be related to each other. You can get ideas from DomainsBot or Namemesh. Web hosting stores websites data and files on the web servers. Without web hosting, you cannot show your content to the public. Take it as a gateway to show your business to the visitors. SiteGround and Bluehost are the best webs hosting for WordPress, which can easily handle your traffic. Before creating a website, know what you need? Either free WordPress themes or a premium one. You will get a plethora of free and premium WordPress themes in the web market. Similarly, there are also multipurpose WordPress themes, which suitable for creating all kinds of websites. If you are confused about choosing the WordPress themes, then kindly go through our article of free or premium WordPress themes. More confused, then feel free to write us down in our comment section, we will gladly help you. All of the below-listed free business WordPress themes are best for the starters or any kind of small and large business. Even though these themes are free themes, they are nonetheless than premium business WordPress themes. They are a very simple user, even non-tech user can easily create a site in a short span of time. Let’s check them out. Ace Corporate lite is one of the best free business WordPress themes. It is also multipurpose WordPress theme that works perfectly fine one any kind of business websites. Such as corporate Site, business, portfolio, creative agency, and blogging project. The theme contains tons of advance theme options that which helps you to create a site as you prefer. Built upon the Bootstrap framework, it is fully responsive and easily adapts any screen size and resolution. It is utterly documented and contains features like Testimonial Sections, Page Layout, Blog Layout, Customizable Banner Slider and much more. Another free multipurpose business WordPress theme that works perfectly fine corporate business, Marketing, Finance, Stock Market, IT infrastructure, Consultant, Wholesaler, Online business etc. It is SEO friendly and uplifts the position of your site in the search engine. Similarly, it offers robust features along with default theme customizer options. No need to have a coding knowledge to configure them. This business WordPress theme includes dedicated sections for the banner, four business resource boxes, footer widget sections, and footer copyright. 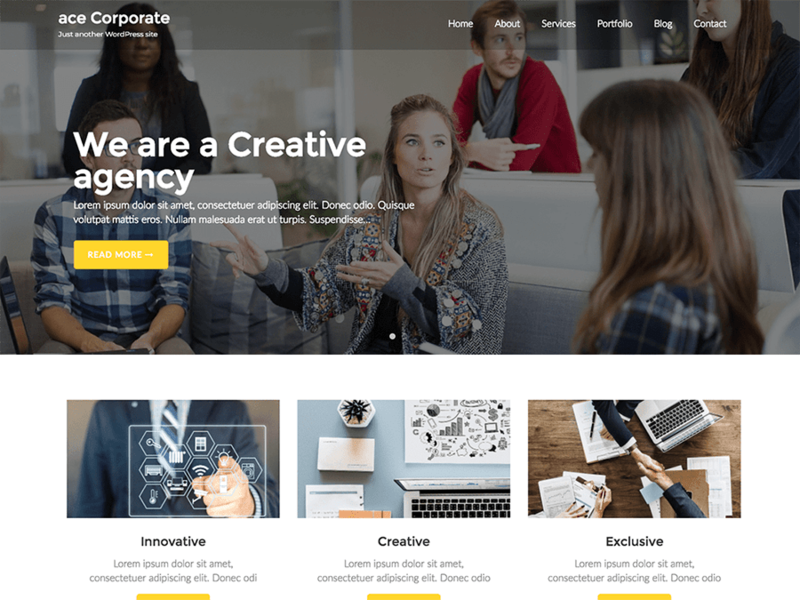 CT Corporate is a feature-rich free business WordPress theme perfect for business, portfolio, blogging or any type of corporate site. It is intuitive, contains a powerful admin panel and customization option that meets the need of various business agencies. Showcase the purpose of your website and service through the banner slider and social media options. Similarly, it has a testimonial section to show the social proof and win the trust of the people. Last but not the least, CT Corporate contains arrays of feature like Custom Menu, CTA, home page design layouts, 3-page templates, 4 widgets Blog Layout, Logo color settings, footer settings and many more. Ample Business is a modern, trendy and the free business WordPress theme perfect for Business, Consulting, and Investments. It is best for those who want to initiate an online venture with no cost. This theme lets you play with the set of widgets and craft a business website as your preference. Ample Business is fully responsive SEO optimized and comes with tons of features like Team Widget, Course Section, Testimonial Section and so on. Business Case is clean and new free business WordPress themes for corporate, e-commerce shop or creative agencies. It is very user-friendly, no need to write a code while customizing theme options. The theme includes homepages templates and widgets to make your site more professional. Business Cast has one click demo importer. Just a click is enough to import a demo website and your business website is ready to roll. Businessly is a free one-page business WordPress theme that shows all the crucial features of your site on the homepage or landing page. It is suitable for the agency, marketing bureau or other corporate businesses and shows services or information in an elegant way within a single page. Businessly has a flat, easy going design, large header, and clean design. VW Corporate Business is the most popular free business WordPress themes for startups and medium-sized companies. It works perfectly fine on architecture, health, design, art, aviation, e-commerce and much more. The themes come with advanced features and functions and stylish material design that goes wow on any screen and devices. If you want to commercialize your business website, you can create a profoundly ravishing online store via WooCommerce plugin. VW Corporate Business comprises features like CTA option, Testimonial section, page layouts, template pages, mega menu options etc. Business Insights is a free responsive business WordPress theme perfect for the business agency and corporate. It is also perfect for creating creative websites, digital agencies, corporate houses, and blog. It is very flexible and offers simple but powerful customize customization options. So, that means you have the power to create a business website without writing a single line of tempering code. Business Idea is a free responsive WordPress theme for business or corporate agency. It is also suitable for lifestyle, cooking, fashion, travel, photography, news, quotes blog and much more. This theme is compatible with WooCommerce plugin and Elementor page builder. You can easily the layout with its drag and drop functionality to change the appearance of your website pages. Built in with live customizer, you can see the changes happening in real time. This business WordPress theme is very configurable and has MailChimp newsletter integration, footer widget, homepage slider, lightweight, and SEO optimized. Rara Business is free WooCommerce ready business WordPress theme for business and corporate websites. With the best companion of WooCommerce plugin, you can effectively sell your products and services online. Not only this, this best WordPress theme works pretty amazingly on events, construction, restaurant, portfolio, travel, education and so on. As Rara Business is schema.org and SEO friendly, which helps to rank your site in Google Search Engine. This ultra retina friendly has features like translation ready facility, RTL Compatible, one click demo import, Custom CSS to name a few. Envo Business is one of the most popular free business WordPress themes having more than 3000+ active installation on WordPress.org. The theme is not only based on business or corporate but it is a perfect platform for creating one page, eCommerce store (WooCommerce), portfolio, landing page, digital agency, product showcase, freelancer etc. It has a very flexible and intuitive design that gives the prominent first impression to the visitors. Giving painstaking attention to the features and functionalities, it seamlessly incorporates with KingComposer and Elementor drag and drops page builders. Envo Business is SEO friendly and WPML, translation, and RTL ready. Probably the best free responsive business WordPress themes of all time. It is a multipurpose WordPress theme that fits the needs to create a portfolio, digital agency, landing page, blog, entertainment, and all informative websites. This responsive theme comes with arrays of crucial features and well-polished design. Packed with easy to use customization options, you can configure theme settings without writing a single line of coding. So these are the best free business WordPress themes. Choose any one of them and create an awesome business website. If you want to suggest a theme for the post, please feel free to mention it in our comment section. We will list it in this post.